Cobleskill Stone Products Inc. received honors by the New York Construction Materials Association (NYCMA) and the Empire State Associated Builders and Contractors (ABC) for its paving project at the NY Safety Track at Davenport, New York - located just outside of Jefferson in neighboring Delaware County. They were awarded the Hot Mix Asphalt Showcase Award from NYCMA and the Excellence in Construction Award from ABC. The awards were based on performance, safety, the material mix design, quality control and ride-ability, of which Cobleskill Stone was not only involved in the design and production of the material but was also the paving contractor that transported and placed the asphalt. Emil Galasso, President and owner of Cobleskill Stone Products, said that he was "very pleased, humbled and honored to receive such a prestigious honor from these two leading trade organizations." He went on to say that he was "very proud of our people who did an excellent job on this project." 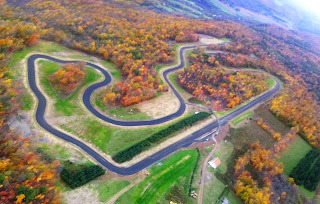 The New York Safety Track serves as a safety training facility for motorcycle enthusiasts. It stretches 2.14 miles with 18 precisely designed turns and long straight-aways with over 450 feet in elevation changes. Mr. Galasso would go on to describe the track as not your "everyday run of the mill paving project," which he explained by saying "special mix designs were needed, special paving procedures and automation were also used." Greg Lubinitsky, co-owner of New York Safety Track said that “The reception and reviews of the track after our first season have been beyond our imagination," adding that "Many accomplished and veteran riders have proclaimed it to be the smoothest riding and technically the most challenging track in the East, if not in the country."